No matter where I (virtually) turned, everyone wrote Queen Victoria popularized the Christmas tree. But you see, the dear lady did something much more important, she revitalized the warm spirit of Christmas. 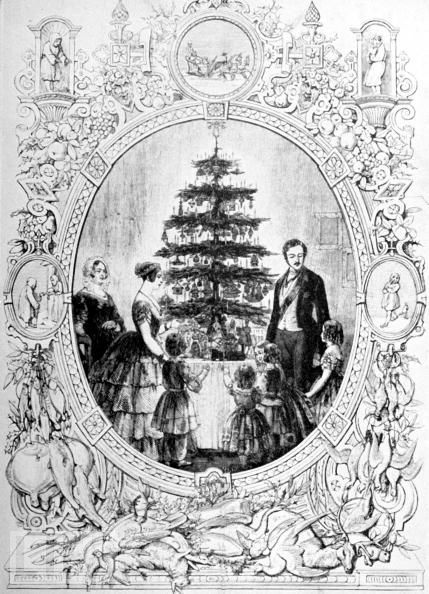 The Weihnachtsbaum (Christmas tree) had been part of German holiday celebrations for centuries and although the myth is that Albert brought the tree with him, Victoria’s Hanoverian heritage had put table trees in her childhood memories long before her marriage to her beloved German Prince Albert. 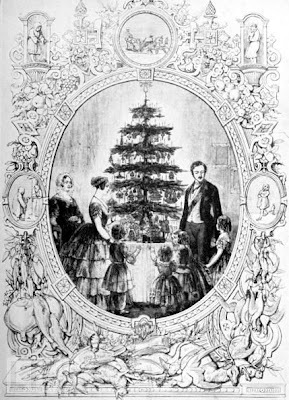 When Godey’s Ladies Book published their American version of the 1848 London Illustrated News engraving of the royal family around the Christmas tree in 1850 … well suddenly everyone wanted a Christmas tree! Victoria loved to celebrate Christmas at Osborne. It was a magnificent Italianate palace designed by Prince Albert, and built by Robert Cubitt from 1845 to 1851 and the family spent many Christmases there, tucked away from Court life at Windsor. It was the young couple’s style of family warmth (there were to be 9 children from their 20 year marriage, after all) and caring that changed the face of Christmas. Before them, Christmas was only celebrated by the well-to-do. Everyone else worked that day, as always. With their influence, many of their subjects broke the shackles of the old Cromwellian Bah! Humbug! 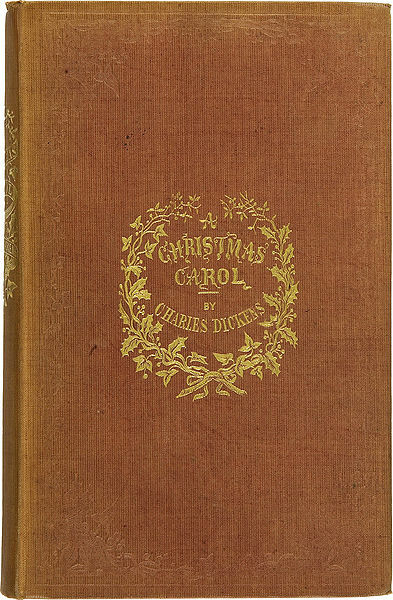 holiday and once again honored the spirit of Christmas as immortalized in Charles Dicken’s 1843 A Christmas Carol with family parties and gifts. 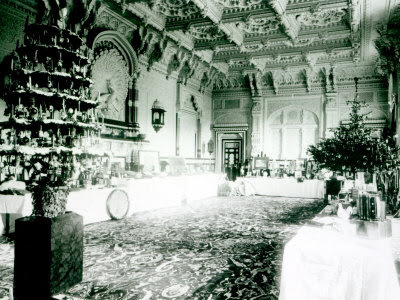 I read all about the Osborne House Christmas at Edwardian Promenade. The largest tree went at the foot of the grand staircase at Osborne House but the household tree went into the Durbar room (after it was constructed in 1891--you can read more about Durbar HERE at Art and Architecture Mostly ) where it was decorated with candles, tinsel, ornaments and spices. 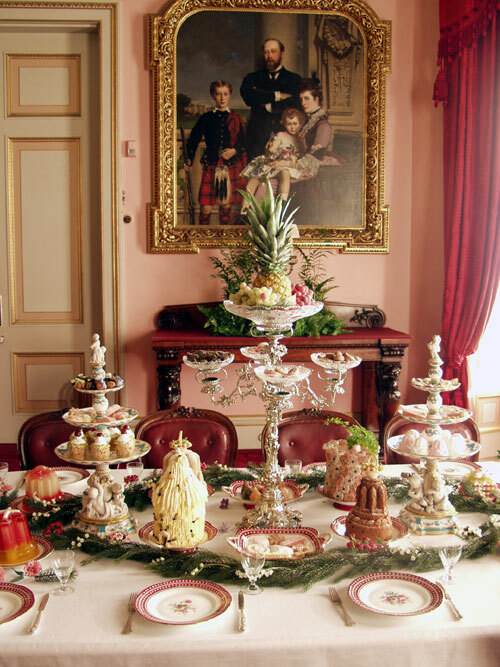 Large tables were laden with confectionary delights and presents for staff and individual tables were set with gifts for each family member so Queen Victoria could inspect them easily. Christmas dinner started at 9pm and for that “50 turkeys, a 140-pound baron of beef [both sides of the rump with the back part of the sirloin] that took ten hours to roast over a spit, hundreds of pounds of lamb, dozens of geese, and crate after crate of vegetables, all shipped by train from Windsor. 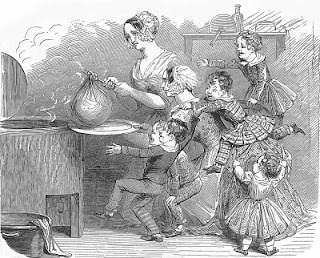 The confectionery chef and his staff spent days crafting 82 pounds of raisins, 60 pounds of orange and lemon peel, 2 pounds of cinnamon, 330 pounds of sugar, 24 bottles of brandy into the Christmas mincemeat.” I would imagine that the Plum Pudding had been stashed away earlier (they were traditionally made on Stir-up Sunday, the last Sunday before Advent – Nov 21 this year) so that they would be perfect for the festivities. Some people make the pudding the year before and continue to splash it with liquor from time to time. Nigella Lawson makes hers the day of the celebration so… your choice. 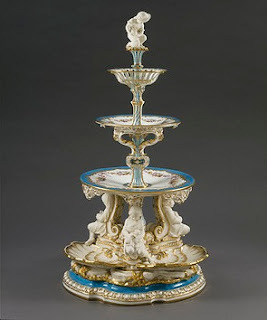 For the royal sweets display, staff might have used pieces from the Minton dessert service, personally chosen by Queen Victoria at the Great Exhibition in 1851 and called The Victoria Dessert Service. 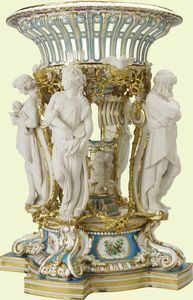 Although it was originally 116 pieces (and cost 1,000 guineas), the Queen gave 69 pieces to the Austrian Emperor (delivered by Herbert Minton himself) but kept the rest for herself. 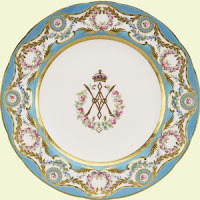 She later added plates to the service (she had given the originals to the Emperor!). 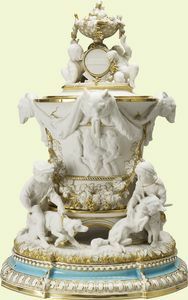 It is on display in the State Dining Room at Windsor till Jan 1. The amazing Ivan Day did an intimate dessert service at Osborne House using similar Minton pieces with an elegant sterling epergne and gorgeous molded desserts (including a Nesselrode pudding fashioned after a beehive) and colorful jellies that must have made the assembly giddy with delight (you can take classes with him to learn to make these beauties)! 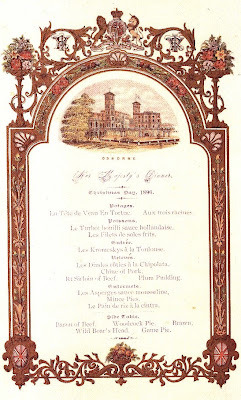 When I looked at good Queen Victoria’s 1896 menu I was torn between "Les Dindes rôties à la Chipolata" (turkey with sausages and chestnuts -- how good does that sound?) or the plum pudding. The pudding won out since I hadn’t made it in ages and I just had a week’s worth of turkey after Thanksgiving. I made this baby 2 weeks before Christmas and it will sit until Xmas day when its’ boozy Scotchy goodness is ready to be devoured after dinner just like Victoria might have done… or Dickens or… well anyone English or English at heart! Plum pudding or something like it goes back at least to the Middle Ages in England. Lovely Elinor Fettiplace had a recipe that is nearly the same from 1604 save that it was cooked with a technique the Romans used… in a sheep’s stomach instead of a cloth or bowl (it had eggs, flour, suet and the ubiquitous currants and raisins like its modern cousin). I believe that it was during the 18th century that the stomach was replaced by a cloth (sadly, I can’t nail down the exact time) that enclosed the pudding and then was boiled in a large pot, suspended on a pole stretched across the top of the pot. 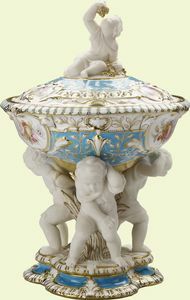 The bowl came in toward the end of the 19th century and is what is most commonly used today… although a few diehards do still use the pudding cloth! This is a combination of many recipes that I’ve done over the years… the scotch makes it a little earthier. Using it was a happy accident. I had run out of brandy when I was all ready to make it once upon a time, and substituted scotch… and scotch it has remained. I recommend the peaty goodness of an Islay scotch (Lagavulin is my favorite!). It makes the dried fruit really dark and delicious and does spectacular things to the orange marmalade. May I suggest a genius ancient idea for leftover pudding? Slice it and stick it under your spit to catch meat drippings (or save them to soak up meat juices) as they did in the old days… what a flavorful treat that would be (I can’t wait to try it!!). Use the final alcohol warmed and set aflame for the special presentation of the pudding. Often, people turn out the lights to better see the flaming dessert… quite a bit of Christmas drama. Oh, and if I may say... I spent years avoiding suet in my pudding (called it bird food).... now that I have a grass-fed supplier in Grazin Angus Acres... well it makes all the difference... what I was missing! You will need a 6c pudding bowl/basin or mold, lightly buttered. Marinate the raisins and currents in the scotch and cider for at least a day. In a large mixing bowl beat the eggs and spice well together, mix in the milk a little at a time, then add the rest of the ingredients including the liquid from the raisins and currants, stir thoroughly. Cover the bowl with a clean cloth and leave for two hours (or overnight). Uncover the bowl, mix thoroughly once more, if the pudding mixture is a little wet add in some more plain flour and stir. Put the pudding in a steamer with a rack on the bottom (or an upturned plate or crumpled foil) so the pudding doesn’t sit on the bottom of the pot. Pour boiling water ½ way up the pudding and steam slowly at a low simmer for 6 hours… taking care to check that the water level stays constant. Add boiling water when needed. Remove from water, cover with new paper and refrigerate till ready to use. When ready, repeat the process and warm for 2-3 hours till heated through. If you are making it the day of, steam for 7 hours. To make the sauce: warm the cream, sugar, lemon zest and scotch till the sugar melts. Add the yolks and under low heat, stir constantly until thickened... taking care not to curdle the eggs. Then soak the pudding with some scotch and store. Put holly in the top of the pudding, warm the last scotch and light for a little Christmas drama! 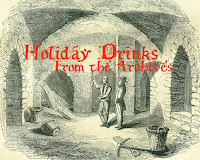 This is another lovely drink from 1869's Cooling Cups and Dainty Drinks and it's a great one for holiday celebrations. Warm and combine coconut milk and chocolate and sugar till melted. Add the vanilla and rum. I did add more chocolate… the original is 1 ounce. May be served warm or cold and is delicious both ways. **Tis the season to give… to WIKIPEDIA!! It’s a great service that most everyone uses and it is done out of the goodness of many hearts. Fill their holiday coffers, won’t you?? Donate a few bucks to keep them going. I'm not a big fan of English porcelain but Queen Victoria's Minton dessert service is beautiful" It almost looks like Old Paris porcelain. Lovely. I think the Lagavulun scotch would be delicious in plum pudding. I also am intrigued by the Trinidad punch. I just might try that this Christmas with my extended family. It sounds delicious and ideal for Christmas. I have visions of Dickens' Christmas Carol! What a delightful post, Deana! You not only cook but put so much effort into the history of each recipe which is so enjoyable to read. Your pudding looks beautiful surrounded by holiday greenery and I am in love with your punch glasses! 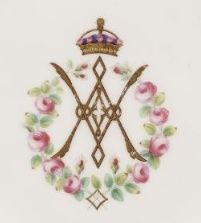 And so, we have much to thank Queen Victoria for! What a lovely post for the holiday season, Deana. And your plum pudding looks perfect surrounded by greenery and filled (and drizzled) with goodies. I make mine ahead too and keep on drizzling. Again LPR photos! Just so you.. I'd say Victoria was pretty spoiled w/ her materials:)She could have a tablescape blog couldn't she? A wonderful Christmas post, Deana. 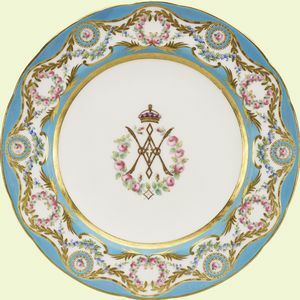 Queen Victoria's Minton dessert service is spectacular and I am very happy to read about the history of plum pudding. It wasn't a tradition in my home, but I do enjoy it and love the story behind it. This is sensational. How I would love to be at Victoria's house on Christmas Eve. And the recipes- wonderful. More chocolate sounds good to me! Oh my, what a list of ingredients. I think I'd make sure I made the drink first. Such lovely photos and words. When you mentioned the Durbar Room at Osborne House, I immediately thought how fantastic the room looked and how appropriate it was for my history of the three durbars. The dessert table in particular must have looked exotic and very festive. I always wondered how the Christmas tree became popularized. This is a neat story. 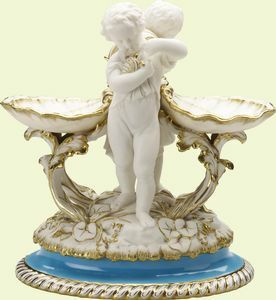 I like the style of the Victoria dessert sets which are defined with such strong elegance. The pudding recipe has quite a few of my favorite ingredients including quince and eggs from Grazin' Angus. They always have the brightest orange yolks of all of the eggs at the Union Sq farmer's market. I cant understand why i do not own a desert set!? Surely there must be some kind of oversight??? 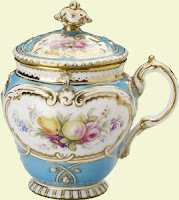 I must let Mr P know that I am missing something which every pampered housewife must have. The plum pudding looks exquisite, very traditional and full of big flavours. hi deana, thanks for your good wishes on my blog. omg this post is incredible... your photos are magnificent, but what is driving me wild is your cocktail. is it wrong to say it sounds heavenly for my breakfast right now? maybe washed down with a little gingerbread cookie... wishing you a very merry christmas! What great pictures! 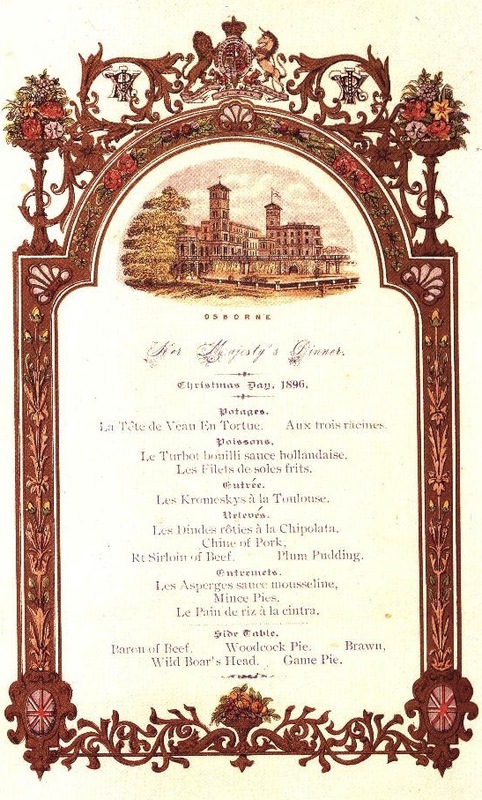 I love the stories behind Victoria and Albert's celebrations, but as I look ahead to hosting Christmas dinner, the 9 pm start and all that food seems a bit daunting. Hopefully I won't have to prepare as much ... The idea of Scotch in plum pudding is fascinating. I may just have to make one to try it out. I had no idea that Queen Victoria popularised the Christmas tree! Now that scotch sounds like the perfect match for a delicious pudding like that! I must admit I don't bake them that far ahead of time-my family don't really like it but hubby does and he will literally devour one in a sitting! I really enjoy reading about old Christmas traditions and their origins...very interesting post! Love your plum pudding too; it's absolutely lovely, especially with that sauce! Another well-written and interesting read. But I have to say, the Trinidad Punch looks awesome. Have you seen the movie about Queen Victoria called The Young Victoria, or something like that? It was marvelous. I cried for her losing Prince Albert so very young! 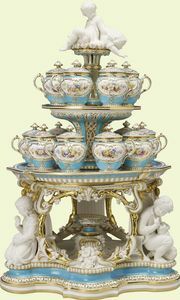 Those Victorian dessert sets are beautiful. Ok... history, recipes, art, gorgeous photos of homes and decor and HISTORY (I know, I repeat but when you see my blog you will understand just how much I love it!)! You've hooked me in!! I'm your newest follower and looking forward to seeing much much more!! Have a lovely Christmas Week! Fascinating read! I did not know Queen Victoria brought the Xmas celebrations to her subjects; how grand of her. Love the porcelain even if they are over-the top kitschy and the pudding and the punch; these glasses are so beautiful it makes drinking what's in them an exceptional experience! Magnificent historical romp through Christmas! I can tell you from personal experience that roast turkey with chipolatas and chestnuts can be either wonderful or mightily depressing depending on the cook. I imagine Queen Vic's version was rather better than the godawful pre-cooked versions for sale in many UK supermarkets. Excellent work on your plum pudding - remember to stuff one (or more) pieces of small change into it (and warn your diners) - finding the coin/s is good luck! Oh, and one more tip, serve boozy pudding with boozy hard sauce, and glasses of port, (and places to lie down). Merry Christmas! Deana what a wonderful post! Your pudding looks amazing! All of that prep of the Victorians makes our lives seem so simple and provencial. No Dollar Store bargains on their tables! The scotch in the recipe adds a twist and the smoked salt sounds interesting. Deanna, so fascianting! The pudding is a deight and must be delicious!! This is a fabulous christmas post-- you write such an enjoyable, and unique, blog! Thank you for putting in the effort. 12th Night: Fun & Games and 12th Cake! Frango Mint Ice Cream Pie at Marshall Field & Co.